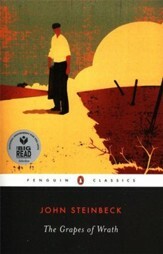 Winner of both the Pulitzer and the Nobel Prize, Steinbeck's classic Great Depression novel follows one family as they're driven from their home and forced to travel west to California. Encountering trials created by the new economic realities they're facing, Stenbeck's drama is fully human-both majestic and tragic. 464 pages, softcover. 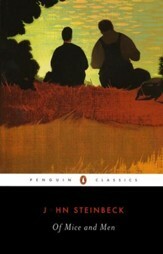 Steinbeck's The Grapes of Wrath still stands as a quintessential piece of great American writing. The story of the sufferings and trials of the Dust Bowl as experienced by one family, the hurt and trials gone through trying to have a small piece of the American Dream haunt. 455 pages, softcover. Charting the dispossessed labor classes, Steinbeck drew upon his own experiences as a California field-worker as he wrote one of his finest short novels. A portrait of the friendship two men shared in a world marked by misunderstanding and callousness, Of Mice and Men is a classic portrait of commitment, hope, and loss. 105 pages, softcover. 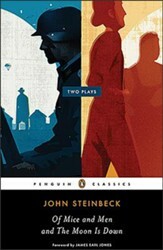 The masterpiece of Steinbeck's later years--a powerful and vastly ambitious novel that is at once a family saga and a modern retelling of the Book of Genesis. In his journal, John Steinbeck called East of Eden the "first book," and indeed it has the primordial power and simplicity of myth. 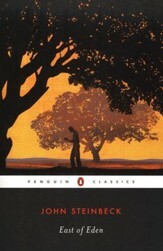 Set in the rich farmland of California's Salinas Valley, this sprawling and often brutal novel follows the intertwined destinies of two families - the Trasks and the Hamiltons - whose generations helplessly reenact the fall of Adam and Eve and the poisonous rivalry of Cain and Abel. 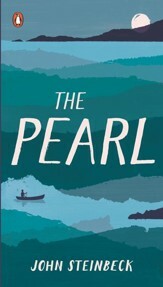 When the news of Kino's great find--the "Pearl of the World"--spreads through the small town, no one suspects its power to deceive, to corrupt, to destroy. Like his father and grandfather before him, Kino is a poor diver, gathering pearls from the Gulf beds that once brought great wealth to the Kings of Spain and now provide Kino, Juanna, and their infant son with meager subsistence. 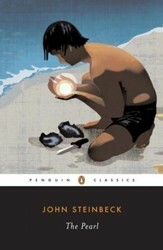 Then, on a day like any other, Kino emerges from the sea with a pearl as large as sea gull's egg, as "perfect as the moon." With the pearl comes hope, the promise of comfort and of security. John Steinbeck's retelling of Malory's beloved Arthurian stories will capture the attention and imagination of legions of Steinbeck fans, including those who love Arthurian romances, as well as countless readers of science fiction and fantasy literature. John Steinback's Pulitzer Prize - winning epic of the Great Depression follows the western movement of one family and a nation in search of work and human dignity. 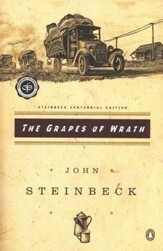 This completely updated Viking Critical Library edition of The Grapes of Wrath includes the full text of the novel, corrected in 1996, as well as extensive critical and contextual material. Literature opens new insights into life and language. Help children enjoy good books and learn foundational reading and literature skills with this "Literature Kit" from Classroom Complete Press. Easy-to-use, the resources are divided into sections: a teacher's guide, student handouts, an answer key, graphic organizers, and a rubric. The teacher's section provides a summary of the story along with a list of vocabulary words for each chapter. The student worksheets include both "before you read" activities (which activate background knowledge, guide connections, and introduce vocabulary) as well as "after you read activities" (which check comprehension and provide opportunities for thoughtful consideration of the text). The "easy marking" answer key features columns of answers that allow teachers to simply line up the worksheet with the k ey to quickly see the correct answers. Grades 9-12 Classroom-reproducible pages; consumable workbook. Aligned with Common Core State Standards. 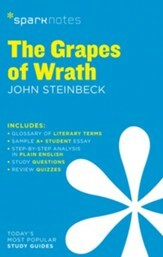 Please Note: the bookThe Grapes of Wrath by John Steinbeck is required and not included with this study guide. 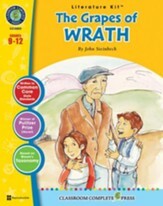 Get at the heart of Steinbeck's The Grapes of Wrath with Sparknotes! This SparkNote Literature Guide includes an introduction to the context of the work, a plot overview, character list, analysis of major characters, an analysis of its themes, motifs, and symbols, and a summary and analysis that takes the reader through the book. It also explains well-known quotations, provides a list of key facts, and includes a set of study questions. There's also a section that provides tips on how to write an essay featuring literary analysis, along with a quiz and suggestions for further reading. 72 pages, softcover. 8.25" x 5.25". 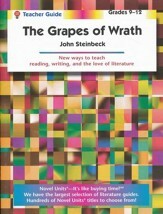 This Novel Units teacher's guide is designed to accompany the (not-included) novel The Grapes of Wrath by John Steinbeck. Including a number of teacher's helps, exercises, discussion questions, assessment tools, graphic organizers, writing and art ideas, critical thinking challenges, extension activities, glossary and more, this book is a convenient guide to facilitating discussion. Background information includes a summary, information about the author, and ideas for initiating activity; the discussion questions follow the chapters in the book. 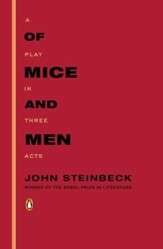 Page numbers are included, which reference the edition quoted in the front cover. [Penguin Books paperback edition, copyright 1939]. Paperback. Grades 9-12. Make movie-night into an educational opportunity! 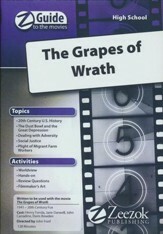 This Z-Guide to the Movies is the perfect guide to incorporating The Grapes of Wrath into your study of the Great Depression. In a convenient, printable-PDF format, this study guide contains a topic overview, movie synopsis, and ten learning activities based on the film. Students will learn about the Dust Bowl, Route 66, government relief agencies, and more. 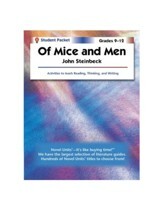 The Novel Unit curriculum is comprised of this Student Packet, and a sold-separately Of Mice & Men Novel Units Teacher's Guide; the book "Of Mice and Men" by John Steinbeck must be purchased separately. A few pre-reading activities are included to gauge a student's familiarity with the context of the novel. Once the student has began reading the novel, graphic organizers, vocabulary activities, review and comprehension questions, quizzes, a final test, puzzles, project and essay ideas are included. Exercises help students focus on literary and character analysis, as well as critical thinking and comprehension skills. 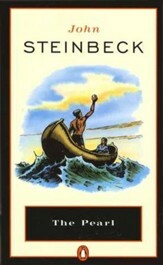 Student questions reference the edition quoted in the front cover [Bantam softcover edition, copyright 1937 John Steinbeck, copyright renewed 1965]. 32 reproducible for classroom use pages, softcover. A line-listed answer key includes answers for the study questions, activities, and comprehension quiz. Grades 9-12. 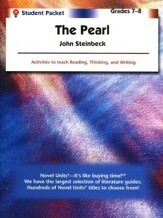 This Novel Unit Student Packet is designed to be used with the not-included The Pearl Novel Units Teacher's Guide; the book The Pearl by John Steinbeck must be obtained separately. A few pre-reading activities are included to gauge a student's familiarity with the context of the novel. Once the student has began reading the novel, vocabulary activities, graphic organizers, review and comprehension questions, quizzes, a final test, puzzles, project and essay ideas, and a line-listed answer key are included. Exercises help students focus on literary and character analysis, as well as critical thinking and comprehension skills. Student questions reference the edition quoted in the front cover. 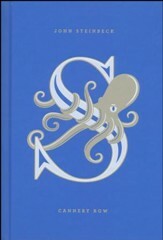 [Bantam softcover edition, copyright 1945 by John Steinbeck and 1974 by The Viking Press, Inc.] Pages are reproducible for classroom use; softcover. Answers included. Grades 7-8. In each book, students begin with 25 vocabulary words (taken from the literature) that they're likely to encounter in other contexts. Before reading the book, students take a pretest and record the results in "Word Logs," which require figuring out meanings from context, using a dictionary, and other reading skills. Students will also study the root words, prefixes, and suffixes of each new word. A variety of reinforcement activities are included; students conclude with a post-test. 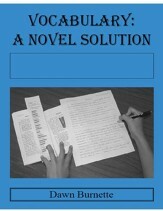 This workbook is designed be used alongside the book "The Pearl" by John Steinbeck, which is not included and must be obtained separately. Designed for grades 6-12; parents may wish to evaluate the literature for content for younger students as many of the texts in this series are assigned in high school.